The Historic Sundial is possibly the most significantly historic home in Oklahoma City. Built by the John and Peter Sinopolous who were the developers of Delmar Garden Park in 1902. The native Greek immigrants were also the most important theatre developers and owners in the early 1900's in Oklahoma City. The architect John Eberson designed the Sundial along with the Midwest Theatre which was razed in the Urban Renewal. Eberson is probably the most famous atmospheric theatre architect in the the US. In the main room you will notice the details of his design which I believe are sound resonators for theatres. The acoustics in this room would be perfect for a small theatre. I was told by the niece and her husband that all of the tiles, lighting, gates, stained glass, and marble were imported from Europe during the First World War. 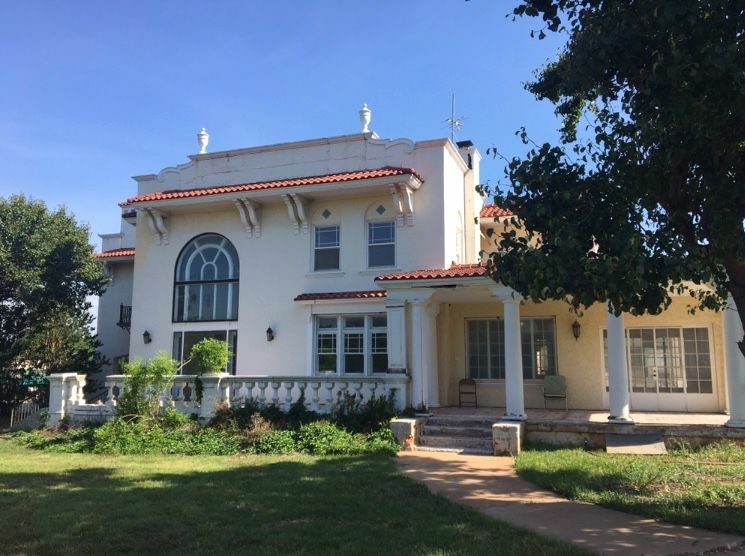 This property is filled with historic feathers along with lush grounds which include three ponds and a foot bridge built of coral rock shipped to Oklahoma City during construction between 1915-1919. The carriage house and the home construction began in 1915 and the home was completed in 1919. Originally the home was on 40 acres where now sits some development, Mt. Olive Baptist Church, and some senior cottages. The verstile use of this priperty is waitng for the use and purpose. The niece and her husband added on in the 70s an indoor pool, garage, and third living area. This would be the most flexible space for ADA compliance. This property would make a great Venue for Weddings and Events, Bed and Breakfast, Spa, Wellness Center, Mental Health Practitioner offices, Executive Offices such as designers, architects, attorneys, and much more. Possible purchase may be available.